1. Non-profits - Our professional pitch coaching helps non-profits and social entrepreneurs better articulate what they do, helping them secure funding not only at the TFN event, but from other sources in the future. By presenting their work at TFN events, non-profits gain access to new networks and valuable pro bono resources, not to mention the incredible sense of confidence that pitching to a supportive crowd brings. TFN’s committed support for our alumni brings ongoing exposure to even more capacity building and funding opportunities. 2. Guests and donors - In addition to multiplying impact by pooling funds, TFN is a fun and accessible way to grow collective insight into challenging social issues and to be inspired by the social innovation that exists all around us. The intimate connection to social change leaders and other guests at TFN events stimulates conversations and creates new relationships based on purpose and passion. It’s connection and inspiration all round! 3. Event hosts and partners - TFN gives businesses a way to showcase the role of CSR or community investment programs and to super-charge workplace giving. 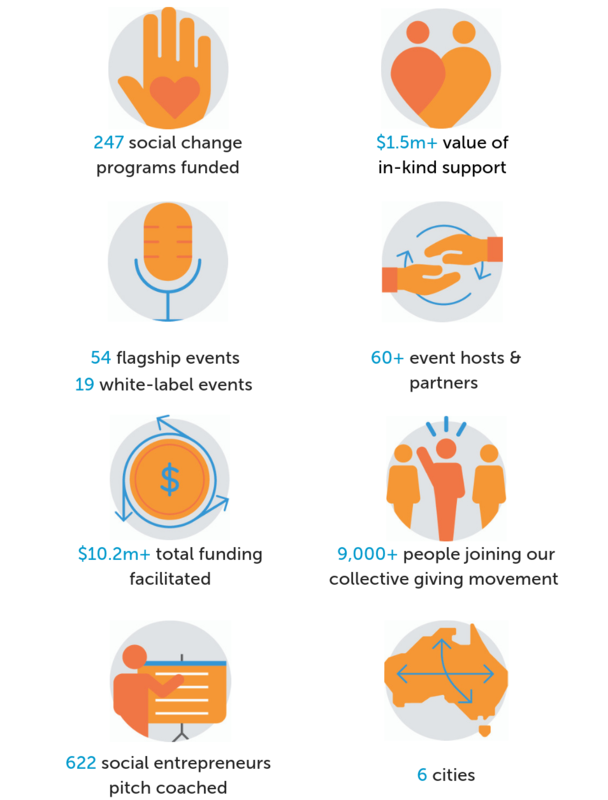 Corporate and family foundations have used our event format to leverage their match-funding and local governments have used it to introduce like-minded constituents to the work of innovative, local, social change organisations. Read our 2017 Impact Evaluation Snapshot or download the full report here. View outcomes from our previous events or read about our TFN Alumni and their social impact.